Dhaka, 16 April, Abnews: A week later than they would have preferred Manchester City were crowned Premier League champions on Sunday as second-placed Manchester United suffered a shock 1-0 home defeat by bottom club West Bromwich Albion. ‘We’ve won the league for you, Man City, Man City,’ West Brom’s fans chanted after the final whistle. He is the first Spanish manager to win the Premier League title—a prize he says is the hardest to claim in Europe. 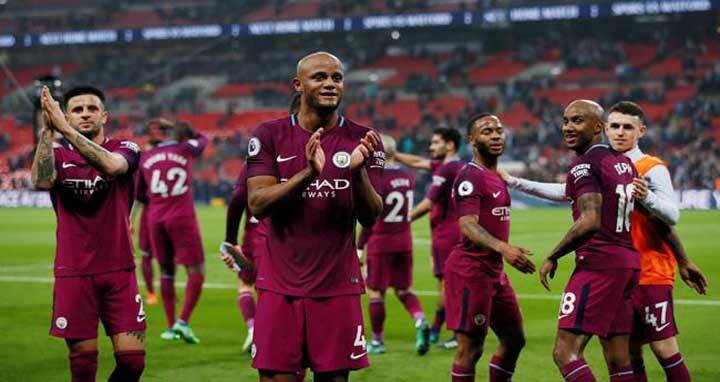 ‘We did it in the way we wanted to do,’ Guardiola said at Wembley on Saturday. ‘We have spent a lot of money to have these amazing players, to make that possible. ‘These players deserve all my respect because they have been unbelievable all season. Only two other players have captained more Premier League title winners—Chelsea’s John Terry (five titles) and Manchester United’s former captain Roy Keane (four). ‘It’s the same feeling as the first time,’ the 32-year-old Belgium international, who unlike his manager did watch the game, told Sky Sports. ‘You can’t describe it.